I was holding my phone, transfixed and petrified, not knowing what to do. This video, which had just been shared on a whatsapp group of my fellow army wives, gave me goosebumps to say the least. Somehow, I played this video again. And again,…. and again. It is one thing to hear about soldiers dying in the line of duty, but a completely different thing to see the pain of their families. The little girl in this video is the daughter of a colonel who died in Jammu and Kashmir, a day after he received a gallantry award on Republic Day. 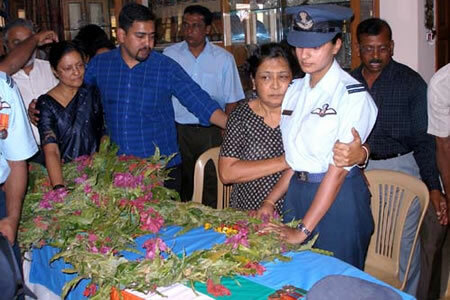 The girl, paying her last respects, shrieks the Gorkha war cry (the colonel belonged to the Gorkha Rifles) and then breaks down as officers and soldiers standing next to her reply back. It was gut-wrenching to see all this, I don’t know why I later replayed the video 4-5 times. It was a reality check. It can happen any time, any day, anywhere, to any of us. 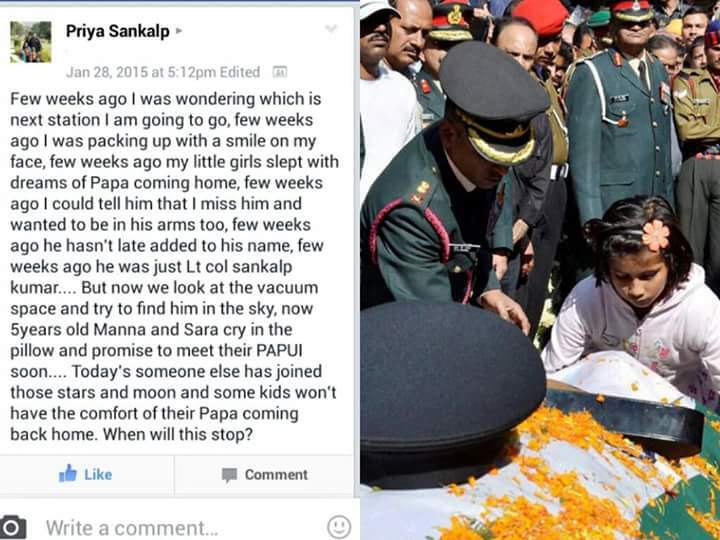 A Facebook status update by wife of a martyr, shared on a Fauji wives’ group. Other Army wives in that whatsapp group were in tears, but I was just in shock. It was a reminder that life in fauj is not just parties and luxury living. The Indian Army advt shown on TV, advertising it as a ‘way of life’ showing all fancy things, sadly forgets to show this dark side. I am not complaining, but I guess pain and grief comes as a packaged deal with all things rosy. I remember, as a young bride, I was shocked to hear Major Sa’ab calmly telling me one evening that one of his coursemates has died on the border. Apparently, they hear such news so often, that it is a ‘way of life’ for them. It doesn’t scare them anymore. It was the first time that I felt fear of death, which was until now reserved for my favourite characters in Harry Potter books. And yes, everyone else is jealous of us Army wives… they say we party too much, and travel to exotic locations and live a luxurious life, and enjoy discounted stuff in CSD. But hey, be jealous of our jigra too, which makes us send our beloved off to the border with a smiling face. Be jealous of the time we have to live alone for months and years without our partners. Be jealous of the fact that we are strong to take on the role of a single parent as and when required. A big and noisy high-five to all women out there who have committed their life to an Indian soldier, knowing fully that his commitments lie elsewhere. I don’t believe you know me, but I know you quite well. I was introduced to you just a couple of days after I joined my husband at his unit location. I have to admit, that meeting you was a very unnerving experience. I think I underestimated your magical power. What power you ask? Oh come on, don’t be so modest. You know it very well. Each year, you cast a spell on hundreds of young girls who marry Armymen. In just a matter of minutes, you make a 20-something girl feel like a 50-year-old aunty. 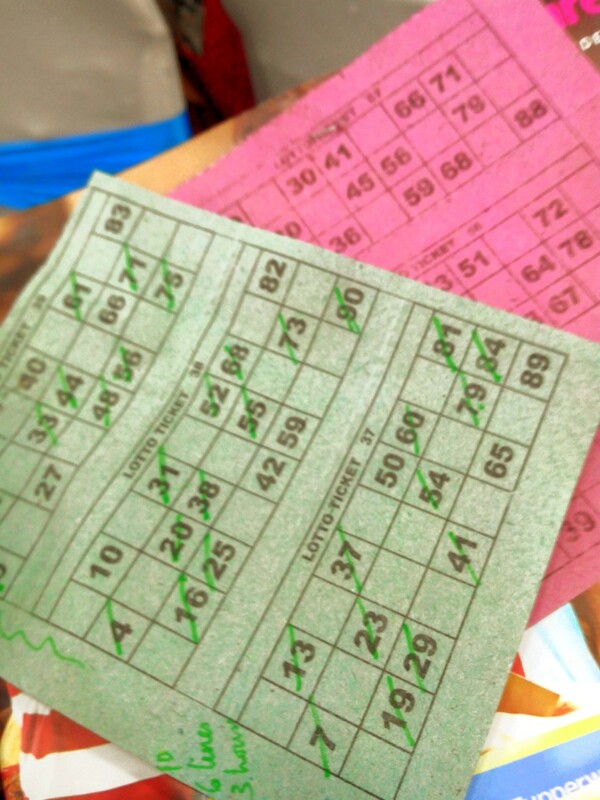 Yes, that is correct… I felt like an old woman who has entered that stage of life where just a game of Tambola gives immense joy. I felt like my hair colour has gone from black to grey just like that. I was in a room full of women who did not burst laughing when the mc said “I am giving it a good shake.” I bit my lower lip when I saw a woman desperately waiting for that ONE number which would complete her full house. Complete her full house? That doesn’t sound right! I am going to be honest, dear Tambola, I feel like your place should be in a museum. You are ancient and have the power to make us young girls feel primitive. You have been a staple of every Army party for so many decades now, and the lucky ones would always swear by you. I saw a slightly modern version of you twice, when instead of numbers, you were dressed in a theme-based avatar. That one time, you had different names of the sun written in some boxes of your 9×3 grid, and those names were called out by the mc to see who was destined to win. Another chance meeting with your rejuvenated self was when it was based on names of different flowers. You can understand why it seems so boring for girls like me who have had many other ways of keeping ourselves entertained. But every time I see you at a party, the joy you bring to many ladies and officers (yes, officers also) is priceless. I can safely say that it is time for you to reinvent your persona. That’s the only way you can get the younger lot to “shake it”.